HDTV Supplys WolfPack 4X4 HDMI Matrix Switch is a full routing type 4-by-4 HDMI matrix switch and supports 4Kx2K resolutions. The management of source/ sink scenarios can be operated easily through on-panel buttons, an IR remote control and the RS-232 software. Because it is a matrix switcher, it allows any input to be routed to any output; or the same input to be routed to all outputs, or any combination. The 4X4 HDMI matrix switch switches HDMI signals in any of 256 combination′s. The 4X4 HDMI matrix switch is HDMI 1.4 & HDCP 1.4 compliant. The 4X4 HDMI Matrix Switch has the ability of equalization and amplification to ensure HDMI signal′s transmission through long cables without any quality loss. The 4K 4x4 HDMI Matrix Switch routes high definition video sources and multi-channel digital audio (up to 7.1 channel) from any of the 4-HDMI inputs to the any of the 4-HDMI outputs. Supports resolutions up to 1080p@60HZ, 36-bit deep color and 4K@30HZ. Allows any HDMI display to view any HDMI source at any time. Dolby TrueHD and DTS-HD master audio pass through HDMI output. Advanced EDID management for rapid integration of sources and displays. Multiple switching mode: push-in button, IR remote control, IR Routing, and RS-232 control. Easy installation with rack-mounting ears. 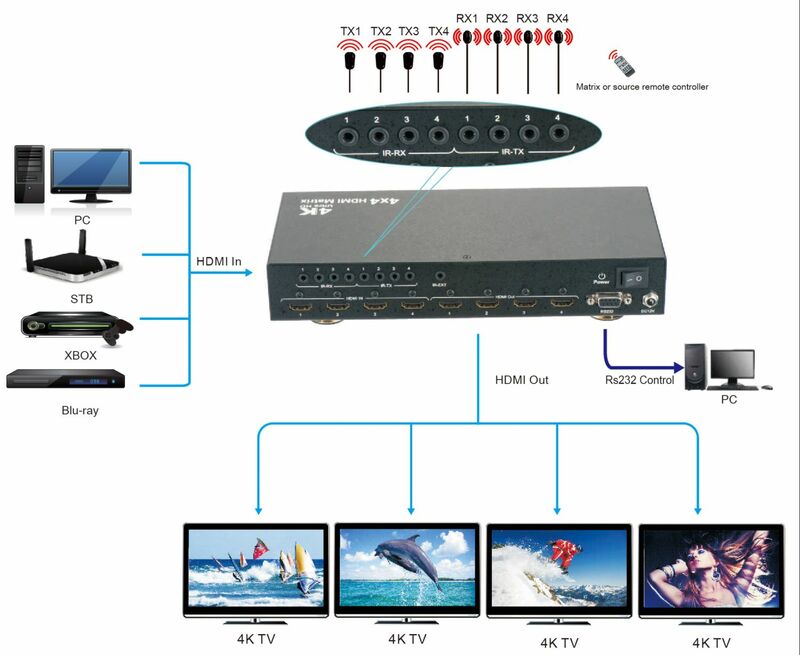 Four HDCP compliant inputs and 4 HDMI outputs provide a pure digital connection. Allows up to four HDMI video devices to be independently switched to four HDMI monitors, HDTVs or projectors. Delivers uncompressed digital video with zero signal loss. 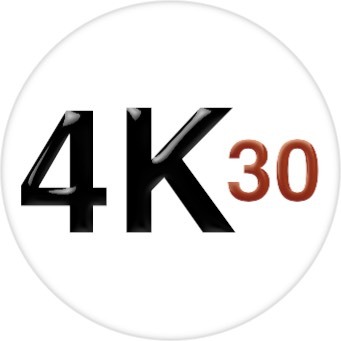 Support high definition resolutions 4K at 30 Hz, 1080p, 1080i, 720p and standard video format. Triple switching modes, auto, IR remote and manual. The 4X4 HDMI Matrix Switch offers solutions for digital entertainment center, HDTV retail and show site, HDTV, STB, DVD and Projector factory, noise, space and security concerns, data center control, information distribution, conference room presentation, school and corporate training environments. Control of this 4X4 HDMI matrix switch can be managed via its front-panel control, IR remote control, and RS-232. The 3D viewing results were awesome in our lab and did not have any picture or audio degradation. The normal and standard (2D) results equally gave a superb picture and audio quality with this 4X4 HDMI matrix switch. Q: How do I install this switch? Unplug all devices that plug into the unit including the above HDMI switcher. Install only one device and one HDTV. Turn them ON. Wait up to 15 seconds to allow the first install to grab the HDCP handshake. If you don't get a picture move the HDMI cable to another input until you do waiting 15 seconds. If you still don't get a picture, move the output HDMI cable to another output. Add the 2nd device using the above tips. In order to see HDTV with HDCP compliance, both the source, the cable, the display and any device in between must be equipped with HDMI connections that can enable HDCP decoding, such as this 1080p HDMI matrix switcher, or you will not see a picture. The older the HDMI gear the more handshaking problems are likely. Cable boxes are among the worst. Powering off the switcher usually helps. Make certain not to send a video signal to a display which is out of range like 1080p signal to a 720p projector. 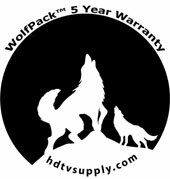 In order to get a warranty reapir for a defective item within the first year call HDTV Supplys Tech Support Team with your order number at 800-841-9238 and they will verify the product is eligible for a warranty repair. An RMA number will then be issued via email. Shipped replacements will be in like new condition, tested and all components included. Please read HDTV Supplys Warranty Terms and Conditions for more.